Our 213th release is 10 songs EP by 6-piece post rock band called La Hot Bier Gang,formed in Rosalio,capital of Argentina. As the artwork and song titles remind us this EP is a work of the feeling of statelessness loading elements of cumbia and the oriental scale,but they gathers it up for one that is so difficult to handle one false step and the sound had been loose. In particular,track 4,"Primer Robot Latino" is the masterpiece in 8 and a half minutes,the elements like kraut-rock and Dub,Latin,free jazz,post-rock are mixed and combined. After the 5th track,by live recording in designer space called Fauna,it is the valuable sample that you can experience a realism of the music scene of Argentina.In addition, it simply gives us a live feeling of La Hot Bier Gang and it's so much fun. 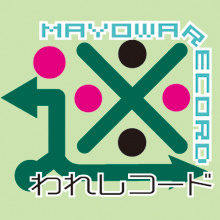 This is the first time that Mayoware record releases the work of overseas musician.I hope that the interchange of the music scene between Argentina and Japan become activated with this release as a starting point. La Hot Bier Gang formed by the end of 2014 during the hot summer season in Rosario, Argentina. The music of the band is a mixture of southamerican cumbia rhythms, arabic melodies and techno/IDM patterns that flow all along in a sonic brew of textures and evolving dancing landscapes emerging from constants impromptus like mantras. The begining of 2016 bring new music to gang expected to be release sometime in the year.